The history of Yiwu Market. Yiwu market has grown out of nothing and expanded from small to large, from quality accumulation to qualitative leap. Yiwu is a mountainous region with large population but poor land. The land was so poor that the local peasants had no others choices but got into trade for a living even before 1600s. It’s a very old trading way. Being lack of money, they had to use something else to trade for what they wanted – chicken feathers. Because chicken feathers were a superb material to make fertilizer, and fertilizer could make their poor land grow more grains. Moreover, the good-looking feathers could also be made into feather dusters for exporting. So they chose one of their native products – brown sugar, then cooked with ginger and shaped in big chunks. These sugar chunks were welcomed by people of all ages and regions. This is the famous sugar-for-chicken feathers pattern. Each year between October to April next year, when there wasn’t much to do on farmlands, and there wasn’t enough food on table, these Yiwu men carried sewing needles, threads, and sugar chunks… in their bamboo baskets, using a shoulder-pole, and travelled extensively near and far to trade with rural villagers for chicken feathers. To attract customers, they also used a rattle drum. 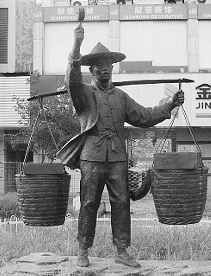 Rural villagers called these Yiwu men: Sugar Shoulder-pole Men (SSM). The first group of Sugar Shoulder-pole Men (SSM) came in 1600s. They were a group of brave solders under a famous general fighting back pirates, after winning the battle and cleaned the invaded pirates. They went back home. These solders were more used to travelling like an army than staying on poor farmland as a peasant. So they became the guru of Sugar Should-pole Men! Years after, Sugar Shoulder-pole Men (SSM) reached a very large number, so there had to be wholesale markets to supply them. So the earliest wholesale markets came out around 1700s in Yiwu. This kind of business went on and on for centuries until PRC was born in 1949. As PRC is a communist country, no free trade was allowed. Sugar Shoulder-pole Men (SSM) were considered as being capitalism and was harshly pressed down. People still needed food, so many of them were still in this business secretly, or in a way that could not be easily caught up by government. As long as there were SSM, there had to be wholesalers to supply them. Wholesalers were also capitalism, big trouble. But they managed to trade along the streets or in some secret places. It was too risky for both SSM and wholesalers. Each time they got caught up, all their goods and earnings would be confiscated, some were even put into prison. This kind of dangerous cat-and-mouse game lasted for 33 years until some day in April. 1982. After her goods were confiscated again, Mrs. Feng Ai Qian, a young woman with 5 kids to support, had no choice but went directly to the then Yiwu Mayer, Mr. Xie Gao Hua, and told him that she desperately wanted to do business, other poor people also wanted to do business. Why they could not do business? Why the governor didn’t care his people’s living? This slam also slammed the mayor went into a-several-month investigation. After his investigation, he found that the secret wholesales were all in a better living condition than those peasants. So he finally made a very brave decision: let the ball roll! That was a very brave decision, as he could easily lose his job or even be put into prison for supporting capitalism. But he did that, only for the wellbeing of his people. And it was very lucky that Mr. Deng Xiao Ping (the China president who shot the gun for Reform and opening-up) was also considering free economy then. Then the local government put cement boards over a stink ditch nearby Huqingmen street, and set up around 700 stalls on September. 1982! According to the development history of Yiwu market, market expansion and building has happened nearly every 2 years. The second generation of Yiwu market which was called “Xinmalu market” replaced the first one “Huqingmen market” in 1984. In 1986, “Chengzhong Road market” replaced “Xinmalu market” which was the third generation of Yiwu market. In 1988, this marketed expanded constantly which had extended to Huangyuan Road. Then Yiwu Municipal Party Committee and the Government decided to build a large-scale indoor commodity market in 1991. Phase I and Phase II of the fourth generation market finished every 2 years. After the completion of Binwang market in 1996, all the rebuilding of booths and shacks were finished. In 2001, Yiwu started building the fifth generation market – International Trade Mart Phase I, II and III. Yiwu had created such amazing and significant achievements in such a short time which has attracted a lot of people’s attention from all over the world. Since 30 years of reform and opening up, Yiwu has seized the commercial opportunity of development and has been expanding and promoting all the time. By changing location 5 times and expanding 10 times, Yiwu has experienced a lot of transmutations. Now Yiwu has been named “The biggest global wholesale commodity market” by the United Nations, World Bank and other world authoritative organizations.